As we planned earlier, we are now able to coordinate a tour with three activities, for people who want to combine trekking with cycling and visiting some important cultural points. This tour includes some of the best parts from all our tours, is exciting, beautiful and finally you'll leave the place with an extensive opinion about our country! Private transfer (3h-3h and 1/2) from București airport to Zărnești which is the most important town for visiting the Piatra Craiului National Park. It is also an ideal starting point for approaches in the northern part of the massif (part of Carpathian Mountains). This town lies at a distance of 28 km from the city of Brașov, by road, bus or railway. Accommodation and dinner to an certified eco-touristic local guesthouse , named "Mosorel". In the morning we’ll visit the Bear Sanctuary “Libearty” from Zărnești. A bear sanctuary is a place of shelter and protection where bears rescued from years of suffering in captivity can live out their lives in a natural forest habitat. The bears are rescued from a life of captivity in small cages where they have been kept as pets or curiosities, or from run-down zoos. Today we'll follow a narrow path who takes us at the foothill of Piatra Craiului west side. Along the way we’ll visit an ancient monastic shrine built in a cave, a holy place for the inhabitants. Picnic-lunch here. Accommodation and dinner at a mini-hotel with very good conditions and food, in the middle of the nature, far away from civilization named “7 Crai” 15 km and 400m+. Mountain biking with trekking, so in the first part of the day we'll descent 12 km by bicycle on a paved road back to Zărnești .We also visit the local headquarter of Administration of Piatra Craiului National Park, where visitors will receive explanations about the importance of environmental conservation in this unique area. Tourists will have access to extensive information about the flora, fauna, and preservation of our area. 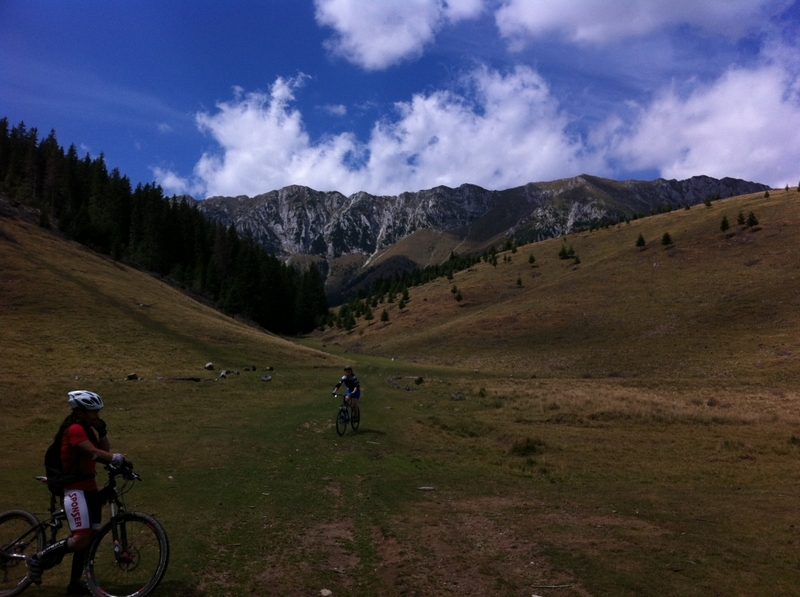 We’ll continue to ride on the road to “Fântâna lui Botorog “ where we'll leave the bicycles. Here is the starting point for our trekking: climbing until the “Curmătura Chalet”. Picnic and the famous apple-pie. From here we descend back to our bicycles through the “Zărnești Canyon” and after that again on our bicycles for the last uphill until “Măgura”,one of the most charming mountain villages from Bran country. Accommodation, dinner in a local guesthouse Pepino’s house. 15 km mtb with 300m+ biking and 15 km with 750m+ trekking. Măgura-Moieciu de Sus. A 35km and 600m+ cycling day in which you will get closer to the locals. Is an opportunity to see how they live and to catch a glimpse at some trades that are already lost in the western world. Picnic-lunch on the way. We'll cross mountain villages with traditional ancient houses. Here, the inhabitants are livestock breeders, with a long time tradition in cheese preparing. We will cross through alpine pastures where from May to September we find shepherds and their flocks. Overnight, dinner in a local guesthouse in Moieciu de Sus, Daniela’s house. Moieciu de Sus- Bucegi National Park-Moieciu de Sus. A trekking day, today we have the opportunity of exploring the north side of the Bran country, one uphill on a ridge where we can admire the Bucegi mountain, pastures and alpine meadows, small traditional houses, unforgettable landscapes. 15 km and 600 m+. Picnic-lunch in our way. Accommodation, dinner in the same place as yesterday. You need a full day for visiting Brașov, one of the most important and charming city from Romania. Lunch in a very good restaurant. Private transfer to Bucharest airport. Prices: for 6 person group 950 euro/person. The price includes: 7 days half board accommodation in double rooms and picnic lunch, 6 guided days, private transfer from airport and back, luggage and bicycles transfer between accommodation, technical T-shirt, bicycles renting, resort fee.